Ortho Molecular Products -- Commitment to efficacy. Ortho Molecular Product's lifelong commitment to efficacy influences every effort they make to formulate efficacious nutritional solutions for use by health care providers nationwide. Ortho Molecular Products are the very best at using research-based formulation and uncompromising raw materials to develop efficacious supplements intended to help get patients better, faster. Quality is measured by many different standards. At Ortho Molecular, they define quality by the highest measure for supplements—efficacy. If a product or formulation or raw ingredient doesn't yield an efficacious product, then to Ortho Molecular, it is not quality. You can trust Ortho Molecular Products to help you get your patients better faster. When you demand quality, demand quality to the power of e.
While Ortho Molecular welcomes recent regulations that will help to ensure product safety, we recognize they can do nothing to ensure product efficacy. Ortho Molecular's passion for efficacy holds them to a higher standard. This is the driving force behind their own stringent manufacturing procedures and uncompromising raw ingredient selection. Ortho Molecular Products does more than make products…we manufacture to the power of e so your patients get better faster. 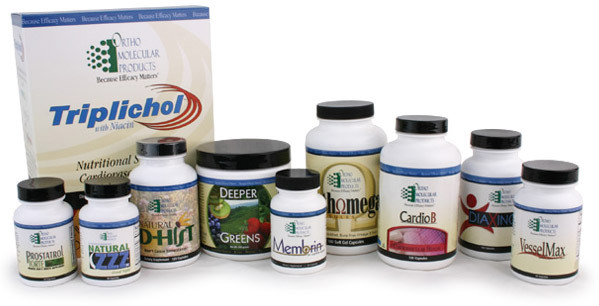 Ortho Molecular Products, Inc. has been manufacturing dietary supplements with unsurpassed efficacy for 25 years. An indispensable partner to healthcare professionals, Ortho Molecular Products is an innovation leader, having developed products such as Natural D-Hist, Cardio B, Ortho Biotic, InflammaCORE and Orthomega. Deeply committed to their long-standing pledge to honor the doctor-patient relationship, Ortho Molecular Products believes evidence-based, lifestyle and nutritional therapies will transform the practice of medicine. To that end, Ortho Molecular Products is dedicated to creating innovative clinical models to help healthcare professionals implement lifestyle medicine into their clinical practice.